Jay and I free-styled Saturday night dinner, making a Portobello mushroom, red pepper & kale risotto. 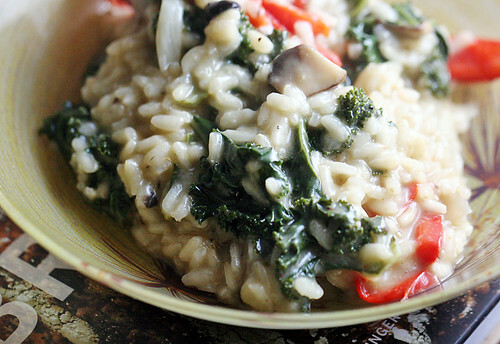 We used about 6 cups of mushroom stock for 2 cups Arborio rice. Also added: butter, shallots, garlic, sage, a little cayenne pepper, vermouth and Parmesan cheese. In this handy video, Jay demonstrates the almost constant stirring of the risotto while listening to Randy Bachman on Vinyl Tap to ensure that all the liquid is absorbed.